For me, what’s truly wonderful about Christopher Petit’s debut feature, Radio On, is the fact that it’s British. Having often condemned the UK film industry as, on the whole, uninspired and frustratingly ‘by the numbers’, I find it tremendously encouraging to see that a voice as distinctive as this can slip through the net. Channelling a spirit that echoes the work of mainland Europe, Petit doesn’t pander to the expectations of British cinema. By stubbornly refusing to pigeon hole itself, Radio On defies the established conventions of the ‘Brit Flick’ and, as such, feels like a breath of fresh air. It’s challenging, playful and a truly unique entry in the British film canon. In fact, this criminally underseen oddity is so gloriously different to the majority of home-grown output that it feels like a mini miracle - and one that you won’t soon forget. Now admittedly, on first viewing it can be a little difficult to get to grips with. Because in terms of plot at least, there’s really not a whole lot to get your teeth into. Set in a bleak vision of seventies Britain, it stars David Beames as a DJ, who drives from London to the West Country after hearing the news that his brother has been found dead in his Bristol based flat. Having set out with the intention of uncovering the bizarre circumstances of his death, Robert’s journey is soon diverted by a series of random encounters with the likes of German women, disturbed hitchhikers and Sting working in a garage. But this is no wacky road trip. Devoting much of its run time to extended shots through the windscreen of Robert’s car, Radio On is a quiet, subdued amble through a barren vision of industrial Britain. Like a precursor to the early work of Jim Jarmusch, it refuses at every turn to follow a recognisable narrative route, but ultimately that’s what makes it such a rewarding experience. A far cry from the fast paced, event driven spectacle we’ve grown used to, Radio On is a film that lives for the little moments and everything that makes them worth remembering. If you’ve ever been on holiday and enjoyed the trip more than the destination, then perhaps this is the film for you. Because Radio On is about the journey. It’s a film driven not by the narrative, but instead, by the mood, by the people, by the scenery and above all, by the music. Perhaps unsurprisingly, given the title, the soundtrack is vital to Radio On. In fact, the music is held in such high regard that Petit takes the time to list the songs in the opening credits. And who can blame him. With contributing artists like David Bowie and Kraftwerk, the track list reads like a mix tape any one would be proud of. But it’s not so much the choice of songs, but how they’re used. With a refreshing disregard for subtly, the Radio On soundtrack hits you like a slap in the face. It’s audacious, uncompromising and consistently unpredictable. While most films would save a song like David Bowie’s ‘Heroes’ for the finale, Petit uses it to kick start the intro. It’s a brave choice that sets the bar high and acts like a declaration of the film’s priorities. In Radio On the soundtrack isn’t a mere afterthought or a finishing touch, it’s the foundation of the film. Using it as a tool to craft, shape and articulate an unease about an impending technological future, the music is a means of communication and provides the perfect accompaniment to the film’s distinctive visual landscape. Combining creative camera work, gentle editing and stark but sumptuous black and white photography, Radio On creates a hypnotic vision of concrete England. A country seen predominantly from the motorway, it brilliantly captures the repetition of life on the road and provides a fitting backdrop to Kraftwerk’s impersonal, rhythmic electronica. It’s a stunning marriage of sound and image that gives the film an almost ethereal mood and builds an enduring sense of time and place. In the films striking intro, that opens with a single-take steady-cam shot through a flat, the camera hovers for some time over a note pinned to the wall. It reads “We are the children of Fritz Lang and Werner Von Braun. We are the link between the 20’s and the 80’s”. It’s a curious addition, but one that hints at the thematic heart of the film. Playing like an uncomfortable memory of a time we’d rather forget, Radio On embodies the essence of Britain in the late seventies and epitomises the disappointment of the modern age. Because Robert’s journey is more than just a trip to Bristol - it’s an exploration of a disillusioned generation. The children of the space age have grown up to see the optimism of the past surrender to the reality of the future. The utopia they’d once been promised has failed to materialise, leaving the landscape scarred by the ghosts of unrealised dreams. A world now plagued by high-rise flats and an endless network of pylons, it’s bleak and it’s desolate. But thankfully, the film never succumbs to sensationalism. While the imposing industrial backdrop is ever present, Radio On doesn’t get bogged down in the grittiness that so many other British films seem obsessed with. It doesn’t shun its origins, but manages somehow to rise above them. 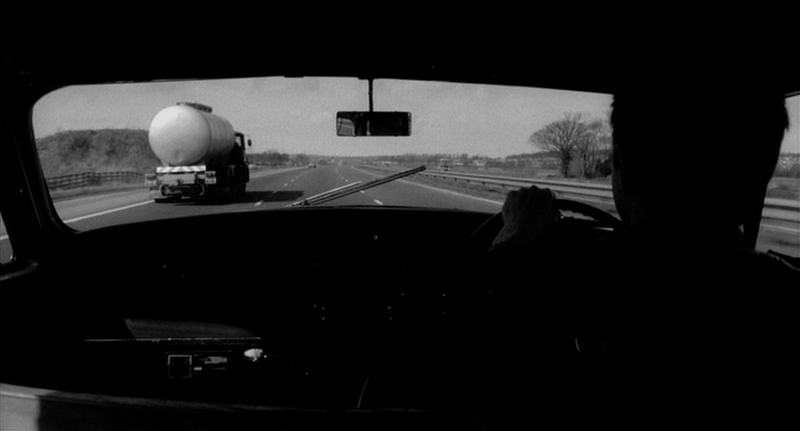 Aided by the striking monochrome cinematography, the film injects a sense of poetry into the austere landscape. It maintains a strong, unflinching sense of Britishness, but softens it with the thinnest veil of fantasy. It may not be immediately obvious, but with controlled performances, detached dialogue and a short acoustic musical number from Sting, Radio On walks a subtle tight rope between realism and theatricality. As a result, it makes for an experience that feels almost oppressively familiar but somehow otherworldly at the same time. With a pervading, almost dreamlike quality it’s a film that quietly works its way under your skin. You may not even realise it at the time, but the music, the imagery and that beguiling mood leave their mark. Radio On is by no means perfect, but it’s one of those rare movies that once seen is never forgotten. And the British film industry needs as many of those as it can get.